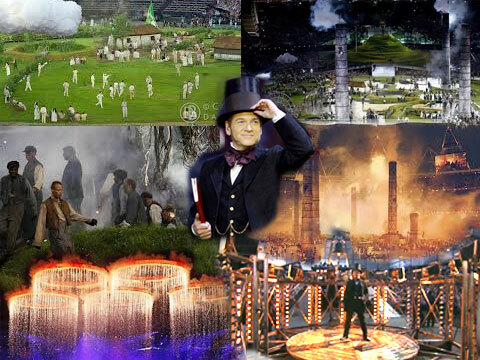 The 2012 / ZION Olympic opening ceremony was an occult statement of subverted history and contrived achievement – against the better judgment ourselves and our ancestors. 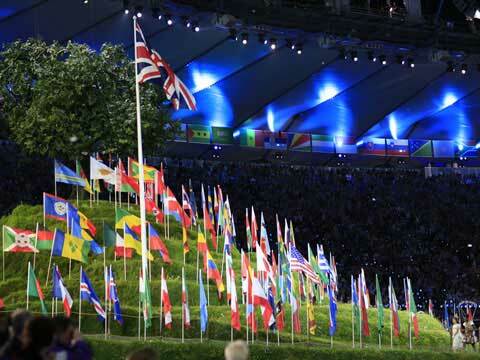 This article covers the Olympic games opening ceremony on the 27th of July and associated themes woven throughout the evening, and some connected information. Imagine for a moment that you were part of a group that runs the world largely in secret. We’ll need to assume that the very existence of such a maintained group would necessitate a legacy of work down through hundreds and very probably thousands of years. Regardless of the group’s aims or exposure to the public, there is but one simple key and one vital method to maintaining control; have those who are controlled agree with it. Now that we have imagined a suitable strategy required for such a group, let us further imagine that the group controls us with a particular ideal. That ideal is: through competition, the best in humanity is achieved. Finally consider one more idea; the level of enthusiasm in agreement to being controlled is the groups measure of success. In very practical terms, an ideal scenario would be where the people who are being controlled actually celebrate the history and detail of their own control. With these three ideas in mind, we can now begin to see that the chaotic acts of the opening ceremony have very specific meaning. Presented to the world: a series of acts which used allegory, symbolism and suggestion – all masked by spectacle. Regarding the scale of the show, the world has never experienced such an immersive, engaging ‘entertainment’ event staged in its entire history. This was participatory, real-world, mass theatre with a reach of billions. A global level of consciousness literally massed upon that arena for over 3 hours and was manipulated for the duration by sight, sound and smell. Many hundreds of thousands of tears were shed throughout the emotive content. Reducing the finery of the Stage back to its basics, the opening ceremony resonated Shakespearean-levels of emotional influence, as was its intention.Very literally, this show was Shakespeare 2.0. 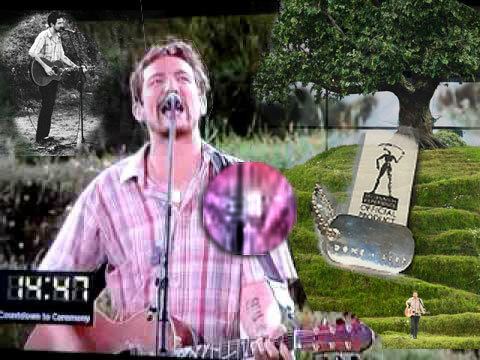 Live at 8.12 on the 27th July, Frank Turner and his band The Sleeping Souls (how apropo) took to the model Glastonbury Tor and sung 3 songs of modern English folk. They played “Sailor’s Boots”, “Wessex Boy”, and “I Still Believe” in front of an on-hand audience of almost 80,000 and a TV audience estimated to be 27 million. There was an air of rebellion to the lyrics too, but the closing line served as an ominous reminder which was repeatedly added to in the set pieces which followed. If you do have the time I would suggest that you re-watch the entire spectacle without commentary – it is far clearer just how well managed the emotive content was without Huw Edwards’s ear-piece commentary, and its impact on the crowd of 80,000 people in the arena that night was resounding. The music was at the centre of the emotional impact, with a memorable score for every moment delivering a subtle suggestion. Firstly, there is a very factual account of the opening ceremony now on Wikipedia. They have missed several things, but it’s worth reading for the soundtrack & timings. After Frank Turner’s pre-show and the Red Arrows flyover, the audience waited another 30 minutes or so for the show to begin proper. Eventually the large video screens inside the arena began to show a countdown before the TV audience was shown a short introductory video, which appeared to be the life of the Thames river from source in Gloucestershire through to London. From what I can gather there is an interesting correspondence between Frank Turner’s song ‘Rivers’ and the suggestions within the video. That suggestion is that the rivers carry our emotions and our memories and are very much as a part of who we were and who we are. After this introduction,he audience was formally welcomed to the show and the grand Olympic secret bell made in the Netherlands was rung by ‘Wiggo’. Bell Ring 1 – DONGGG. The bell was actually rung 5 times, and a couple sounded real different to the others, as we’ll see later. Green and Pleasant Land was Shakespeare v2.0 – The tale of modern serfdom began in the machinations of Isambard. His initial reading from Caliban’s famous speech shows we have a composite character intent on creating Pandemonium on earth, along with the elite secret networks like the Rosicrucians. Their end result is the founding of the Games to socially engineer the masses. This island was once a ‘Green and Pleasant land’ with a deeply spiritual way of life. In the 17th century the industrial revolution began, as the industrialist elite forged a corporate empire upon the backs of the working masses. It was a time of immense human suffering caused from the horrific working conditions. The land was laid waste and polluted on an unseen level, hundreds of thousands died & many came from afar to seek out our slavish labour system; we knew it was wrong to do it, but still we went along with it. The opening scene depicts ‘how life used to be’ – fields, sheep, maypoles, traditional countryside of Albion. Isambard Kingdom Brunel reads aloud from the Tempest Caliban’s speech. This character is not only a master but also a slave as he toils to help produce the industrial revolution. The scene is swiftly demolished to a relentless, harrowing backing track. The workers of the satanic mills spill forth from Glastonbury Tor when the tree is raised in a clap of thunder and lightning. Meanwhile the wealthy industrialist revolutionaries look on and plot the rise of the satanic mills. The culmination of this worrisome time sees Isambard amidst a glowing chamber pulsing with light. What is he up to? The industrialist world emerges ever faster. During a pause in the chaos, a whistling theme is apparent from the song “Caliban’s dream”, featured throughout the night. The industrialists stop and consider what they have done as they confront the suffragettes and the victims of two World Wars. The music crescendos into a peal of descending chimes or bells exactly like these wedding bells. This wedding chime is repeated throughout the night to emotionally pique the viewer. At this point the industrialists remove their hats, perhaps feeling remorse for their actions. Still, the industrialists continue their onward progression of the industrial world, the music rises again, the drumming intensifies. The floor of the industrial world is now fully exposed and an almighty molten steel ring is fashioned by the mill workers. Isambard surveys his vision. 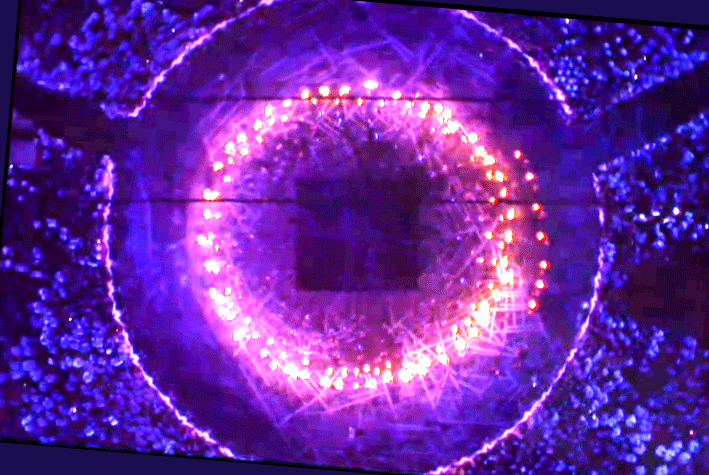 The fifth Olympic ring emerges from the workers as four glowing rings fly together above the stadium. Finally the rings merge and the wedding peal rings again. We have reached a dreamy reckoning, surveying the work of ages of toil and suffering. It is the Olympic Games Rings / Apollyon, son of Zeus. We have toiled to empower and create under the guidance of those who believe humans are at their best when suffering from extreme exertion. This marked the end of the scene and the audience were wildly excited and in awe of the spectacle, applauding the depiction of toil, suffering and death which catapulted Britain in to a world empire which enslaved whole continents. The BBC relocated to a massively refurbished digital broadcasting centre just before the games. They have Prospero on wall facing Regent’s Street. Their building occupies an energetic centre point of London. It’s crazy. 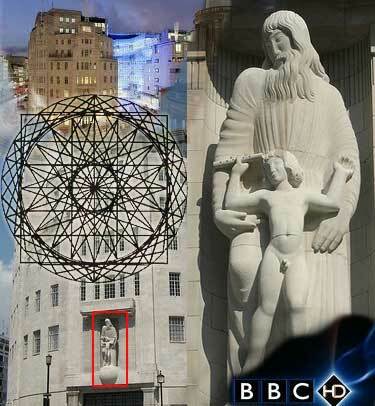 The BBC prominently displays a statue of Prospero on its massively expanded new broadcasting centre at the top of Regent Street. That it also occupies the epicentre of the London Earthstar, as researcher Chris Street has painstakingly detailed in his book London City of Revelation, is neither surprising nor a coincidence. Quite as to the power or the influence lent to the occupants of this Enochian geomantic centre point. John Dee was the first secret agent, signing his letters to Elizabeth I as ‘007’. He was into the usual; occult magic, sigils, talking to the underworld. You know, the usual. Next we have a very entertaining scene sure to please as the Queen gets her first acting role – an event not to be underestimated in terms of pulling out all the stops. 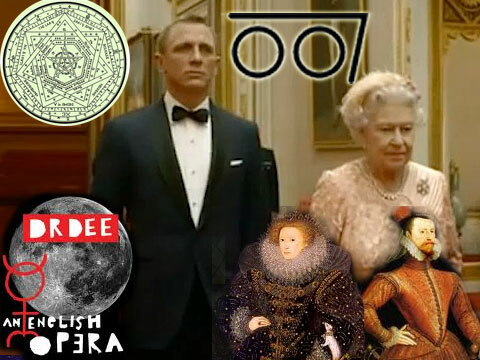 This scene depicts the relationship of the Queen and 007/John Dee (the first secret service agent and a master occultist). Whilst this is a spectacular moment on camera with the Queen’s body-double parachuting into the stadium, we have to realise that the Royals were linked heavily with Magick and Occult Ritual, as they are now. The national anthem is sung by a deaf choir group called ‘Chaos’ who despite being remarkably in tune, do nevertheless offer a slightly discordant rendition. It sits uneasily as we progress to the ‘NHS’ piece to Tubular Bells, of Exorcist notoriety. The inspiration for the odd title is the location of Neverland, given to Wendy by Peter Pan, featured in the works of classic children’s author J.M. Barrie. Straight on till midnight told the story of psychological corruption of young minds and the subsequent mass-drugging with pharmacological ‘medicine’ which really just turns us into mindless zombies. Negative viewpoint? Me?. The NHS / GOSH hospital scene was hailed as typically British/bizarre. It was not when you’re attempting to allegorically detail the eugenics operation and pharmacological poisoning of the human race. The scene kicked off with “Tubular Bells”, known largely as the theme tune from the exorcist. The familiar track dissolves into swing/jazz as nurses jive about and youngsters somersault on their NHS beds. The NHS party slows, the children are tucked in and JK Rowling reads an excerpt from Peter Pan. Much like Isambard in the opening scene, JK Rowling is representing a composite character of the literary elite whose works shaped our minds. The archtypical Peter Pan covertly refers to the Pagan God of Fertility Pan, whose exploits are encoded in JM Barrie’s stories. The nightmare scene unfolds; dark monkeys with glowing eyes chase the children as bells ring all round in a reprise of a more sinister Tubular Bells. The nurses are now dancing hypnotically to the riffs of Mike Oldfield as the children are chased by the denizens of the underworld. Cruella Deville (Cruel Devil) and Voldemort symbolically have warped the children’s dreams into nightmares, and the children are now in a state of fear. Here comes the symbolic institutional cure for fear: Pharmaceuticals! Cue Mary Poppins to the rescue as after all, a spoonful sugar helps the (psychiatric) medicine go down! Now the children are happily dancing to In Dulci Jubilo as the many “Mary”s brandish bottles of medicine. For now at least, the children can sleep again. As they do, a giant baby with rippling stomach is revealed in the floor to a subtle rendition of “Chariots of Fire”. This is the moon-child and is referred to by others as Apollyon – read more on this at the Open Scroll Blog. The crowd cheer the moon baby. 10 minutes of light relief in the form of Mr Bean. Hilarity ensues. Frankie and June was a little more than a modern love story; it was a depiction of the rise of mass psychological programming of generations of youths via music. What? Negative? Me? Really. It’s your basic love story whose first scene introduces little Frankie in 1986 as a boy. His house is a normal suburban affair with a modern family. The scene jumps back and forth throughout decades spanning 2010s back to the 1970s. Throughout it all the house is lit up on the outside with the video of the music being played; this is a symbolic representation of the effect of the music on our own families. Next we have the story of the Torch, detailing the 1948 passage of the torch and the 2012 passage 64 years later. The music is an uplifting track – David Holmes’s “I Heard Wonders” – which has some fairly obscure references. My arms are open but my soul is tired. I hear you whisper come and see. David Beckham / D-B / 4-2 / With the Torch on Thames. It looked like F-Zero (the computer game), only on the Thames which tickled me. This music accompanies the passage of the torch right up to the memorable, light-hearted moment where David Beckham pilots the torch in a neon speedboat under Tower Bridge in a scene perhaps suitably labelled ‘F-Zero on the Thames’. Note that David Beckham resonates Jupiter through the DB intials being the 4th & 2nd letters of the alphabet/ 42. See more on the significance on the DB/42 here and here. The upbeat surpise of this scene is cut down with a funeral-like memorial wall of deceased. Immediately after the ‘memorial wall’ sequence, stadium is in blue light and the Bell rings off screen – the second time of the evening. The next scene is disturbing. Using a heartbeat-backed track harks back to Shakespeare’s’ (aka Francis Bacon) technique of the Iambic Pentameter. It is a rhythmic beat used to entrain attention, and he used it in his prose to capture the audience. The scene is interpretive dance telling story of what I perceived as man’s death and transition. The heartbeat eerily intertwined with ‘Abide by me’ – a haunting, hellish scene in portrayed as the words describe the hopes of a dying man to be saved from Satan by the LORD. It was a haunting, calculated combination of image, dance, lighting, and sinister lyrics but the key is in the heartbeat. Shakespeare 2.0 still uses the Iambic Pentameter. What was the meaning? Something akin to dying, but the imagery of the child reaching for the moon is very significant. Answers on a postcard! Man must reconnect with his inner child, but he struggles to embrace him. Finally, they do, and into the earth they return. The child reaches for the sun / moon? A haunting depiction. I am not sure 100% of the meaning here but it feels dark (no surpises there). However the proferred suggestion that this is a memorial of the 7/7 victims doesn’t sit well. It’s not like I struggled to see the negative overtones in the majority of scenes, but this was particularly overt. Slightly harrowed, I’m grateful for the interlude of the athletes parade which takes nearly two hours. During the parades we do see an out of place ‘Woman in red‘ very prominent in the Indian contingent. It was reported she was a volunteer who gatecrashed the parade (BBC link). The Arctic Monkeys sang ‘Come Together’ by The Beatles for the assembled nubile athletes whilst from afar it looked like a load of sperm had just swum into the arena. One bike / dove did an ET and flew clean across the arena. Then in come the spermy bikes to ‘Come together’ by the Beatles which is decidedly sexual. 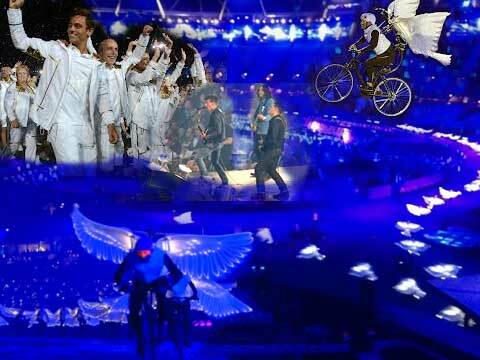 One Dove/Sperm/bike flies across the stadium very much like ET. Then the Queen declares the games officially open, appearing very dour and unemotional. Marina Silva – United Nations Champion of the Earth. Sadly Muhammed Ali couldn’t wave and the flag was then moved to the hill by our NWO champions, and raised by the military to the Olympic anthem. 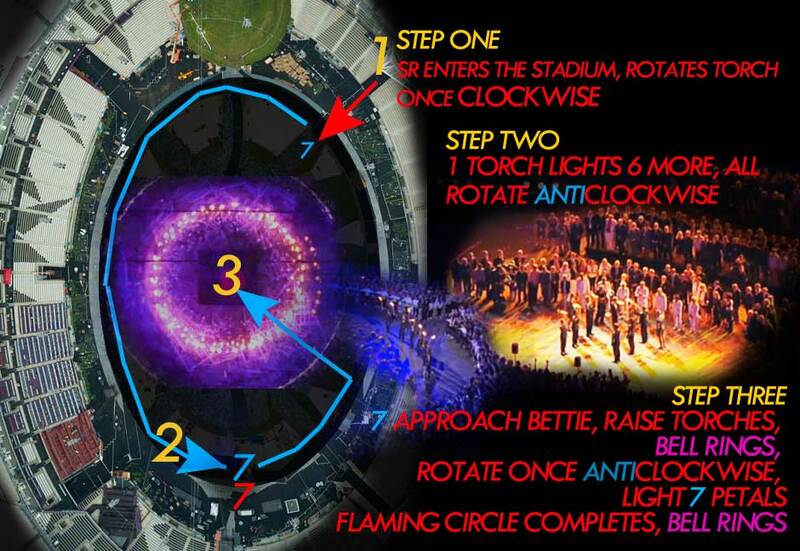 I examined closely how the torch gets to the stadium and lights the cauldron – full of details! 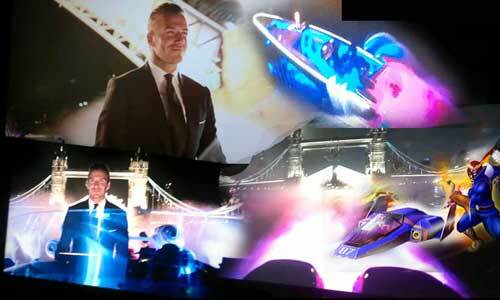 David Beckham/DB comes to the Stadium through the River Lea to Steve Redgrave and passes on the flame. It’s an interesting symbolic comparison that this is how the stadium is energetically charged. As this blog points out, the stadium is on an island of its own, surrounded by the River Lea/Lugh which has an interesting history and is linked with a Deity of Light. Is something happening to the Lea/Lugh as it flows around the Stadium with all the ritual going on? Good old Becks / DB / 42 speeds up the Lea/Lugh and hands over to Steve Redgrave. Seriously high production values throughout this ritual. Weird Olympic oaths are taken in accordance to the ‘fundamental principles of Olympism’ before the flame enters the Stadium. It seems a little like swearing an oath at an alter, or a commitment of some kind. It is noted that “After travelling 12,800 miles (12/8)”, the flame is finally nearing its destination in the ‘Bettie’ Cauldron. Redgrave does not circle the stadium, but pauses to raise the torch aloft, rotates once clockwise, and then passes the torch to 1 of 7 young future Olympians who, in stark contrast to absolutely every other athlete on the night, are all dressed in black. Off they go once clockwise around the stadium, swapping which of them holds the torch in a phalanx formation. As they proceed, the flooring lights up beneath them, forming a large lit circle. After completing about 80 percent of the lap, the 7 young athletes meet 7 senior UK ‘Olympians” who nominated them to light the cauldron. They hug their nominee Olympians and proceed round the stadium with some uplifting, joyous emotional music from none other than Underworld with ‘Caliban’s Dream’; lyrics speak of an otherworldly, guiding flame, who we call to, and it develops a heart beat. The flame then enlightens us so ‘That we may fall’. A sinister message in an emotional track. Who is calling out to who here? The 7 sleepers approach the cauldron. The bell tolls exceedingly ominously as the youth raise their seven lit torches aloft in front of a mass of tubes emanating from the centre. 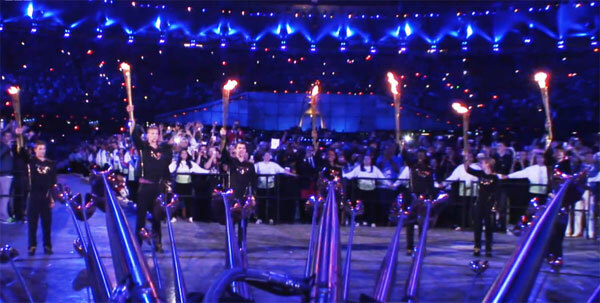 DOOOONGGGGGGG 7 torchbearers approach ‘Bettie’ – the Olympic Cauldron and raise their torches aloft. Hardly a cheerful scene, and, given that Bettie is the name of a nuclear bomb, kind of sinister. 7 seals of the apocalypse kind-of sinister, actually. DONNNNNNG!! As the bell struck four… this is what we saw. The classic point in a circle, formed from the nations of the world, binding into a single flame. Beautiful, sinister, and the absolute focal point of attention. A master class of entrainment. These few moments had a profound effect on observers; many commented that they were moved to tears, many more have frequented the Youtube pages which play the track “Caliban’s Dream” which was interspersed throughout the night and used in it’ entirety during the Cauldron lighting. Here’s a breakdown of what I just described, but the best way to get a feel of the event is to watch it again, if you wish! There were many aspects of ritual, combined with a powerful off-screen bell ringing (x2) at specific moments, with specific images conveyed at those moments. It is all rather ritualistic, and to me it appeared an consecration act. Perhaps a union of deities? I invite your thoughts on all of this! A researcher in the US who has a fantastic amount of insight into the Cauldron Ritual is Bob over at the Open Scroll, and I do believe he might have nailed it with his expose of the Zion Menorah analysis. The bell rings for the 5th and final time of the night just after Macca sings the last line of the last song the Beatles released. So was there anything spooky happening? Well, yes, there was plenty. There was certainly manipulation of emotions and there was certainly a very intense, focussed cauldron lighting which featured two very ominous tolls of the Olympic bell which don’t appear to have been mentioned anywhere else, and they sounded different too. Here’s all the bell rings from the night. Thanks for staying with me, your humble maniac. Very interesting Richie, the anti-clockwise would be references to Saturn, the old Sun, on the North Pole of Saturn clouds/vapours swirl all the time, they move in an anti-clockwise formation and form a hexagon. the cube and 6 pointed star can be formed within the hexagon, hence Saturn being associated with the number 6, ie SATUR(N)day is the sixth day. The death ritual that was acted out at the end to “Abide With Me”, was to me a human sacrifice being acted out in front of the eyes of the world. The boy was the sacrificial victim, and the man was death, coming for the boy. The boy ran from him and did not want to go with him, the man then showed the boy magic tricks, and eventually the boy ran to him, was taken into the fold, all dressed in red and orange, the colours we associate with the fires of hell. He was then raised above the rest to the big Golden Sun as if he were a sacrifice. I think the Golden Sun was the old Sun saturn, their lord Satan, as opposed to the New Sun (christ energy). I also think this is connected in some way to the artificial sun that appeared in Trafalgar Square on Jan 23 this year. Hi Sandra, thats really interesting regarding your comment about Saturn. If you look at the screenshot above of the flaming circle, you’ll see clearly in the middle is a black square/cube, another strong representation of Saturn. Saturn is the six planet from the sun! Stanley Moon: You’re a nutcase! You’re a bleedin’ nutcase!